Fruits contain many anti-oxidants likepoly-phenolic flavonoids, vitamin-C, anthocyanins. These compounds,firstly, help body protect from oxidant stress, diseases, and cancers, andsecondly, help body develop capacity to fight against these ailments by boosting our immunity level. Many fruits, when compared to vegetables and cereals, have very high anti-oxidant values which is something measured by their “Oxygen Radical Absorbent Capacity” or ORAC. Fruit’s health benefiting properties are because of their richness in vitamins, minerals, micro-nutrients, anti-oxidants which helps body prevent or at least prolong the natural changes of aging by protecting and rejuvenating cells, tissues and organs in the human body. The overall benefits are manifold! Fruit nutrition benefits are infinite! You are protecting yourself from minor problems like wrinkling of skin, hair fall, memory loss to major ailments like age related macular degeneration of retina in the eyes, Alzheimer’s disease, colon cancers, weak bones (osteoporosis)… and the list of fruit nutrition benefits never ends! Dry fruits are rich source of nutrients such as vitamins and minerals. Consumption of some dry fruits daily enhances the overall bioavailability of nutrients. Try raisins (dried grapes), apricots, dates, figs, tamarind…etc which are indeed very good in iron, calcium, zinc, selenium andmanganese. In addition, mixing dry fruits with some fresh fruits would help you get vitamin C which in-turn favors absorption of iron inside the stomach. Barring few fruits like berries, try to wash them soon after shopping. Rinse them in salt water for few minutes and then wash in cool running water until you are satisfied with complete cleanliness. This way you make sure that the fruit you eat is rid-off dust, sand and any residual chemical spray. 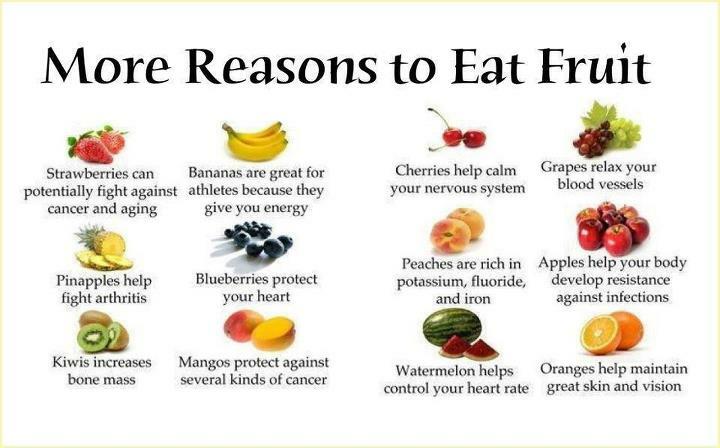 Eat them while they are fresh because, certain fruits have very short shelf life and the health benefiting properties of fruit declines with time. If you need to store them, place them in plastic wrappings or in zip pouches to keep them fresh for short periods until you use them. Eat fruits as a whole without any additions to get their original flavor, taste, and to get maximum fruit nutrition benefits.